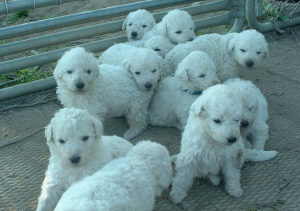 All puppies are cute and cuddly, Kuvasz puppies are no exception. They are strong, sturdy, bright-eyed with a alert and curious nature. Hopefully you’ve done your homework and now realize that Kuvasz temperament is quite unique (and not for everyone). They do make loyal and devoted family pets, however being a “working” breed with the innate behaviour to look after property and livestock, they are a very independent breed that likes to do things their own way. Depending on the type of temperament you prefer, we can match you with a more bold and outgoing puppy or a quiet, reserved one – either one will make a good adult with the right training and socialization. Just be aware that they take their role of a guardian very seriously and will respond best to lots of love mixed with structure. When are they ready to go to their new home? When our puppies reach eight to ten weeks of age they are ready to begin their life in a new home. If you have young children or other animals, we recommend a younger dog, as they will fit more easily into your family and lifestyle. However during the first six to sixteen weeks (just like a new baby) your puppy will require a lot of love, time, patience and guidance. If you don’t have the extra time to invest, it may be better to get an older puppy who has been somewhat socialized and trained. An older dog can take up to 6 months to bond and become the dog of your heart, but it is often worth the wait. 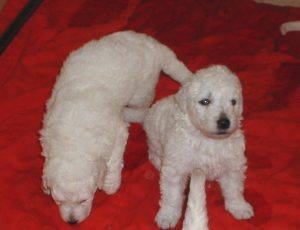 Either way, we will work closely with you to determine the temperament and age of Kuvasz puppy that would be best for you and your family. 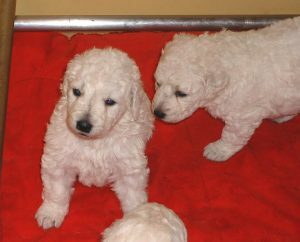 If you think you’re ready for a Kuvasz please browse through our upcoming litter page. Note: All of our breeding stock (parents and grandparents) have been “cleared” of hip dysplasia with an x-ray.